We know. It’s dark early. It’s cold. And spring fever has hit you and the New Year has just begun. Lighten up and get ahead of the game. 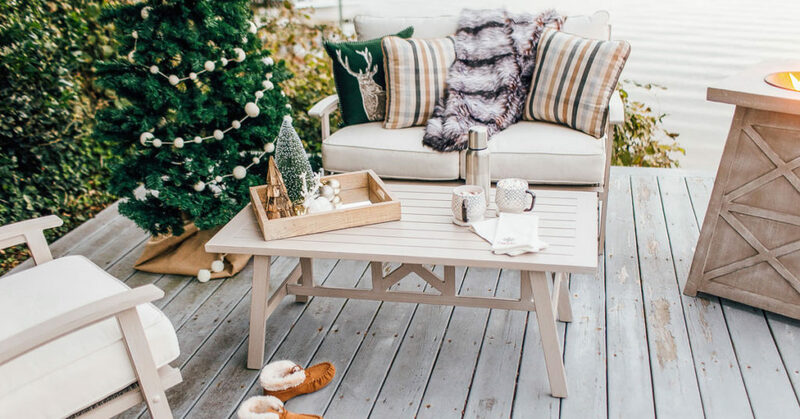 Start warming up with some of these ideas that can keep the chill at bay, until it’s time to get your outdoor entertaining back in full swing. Plan Ahead. Take this time to map out your existing outdoor space and decide what you’d like to do next. Keep a notebook or vision board to jot down to-dos, ideas and additions that will give you inspiration and a head-start should that unexpected mild weekend roll around. Add Some Color. Check your local agricultural resources, garden centers and library to find out which winter plants can add little bursts of color to your patio or outdoor areas in your zone. Rearrange Your Space. Have you had the same patio setup for longer than you can remember? There are tons of online furnishing tools and apps that can help you freshen up your outdoor space by rearranging your seating or dining group, or changing the flow between different outdoor spaces. You’d be surprised how refreshing it can be to add just a few accent pieces or coordinating accessories. Warm It Up. Can’t stand the thought of staying in ALL WINTER LONG? Be bold. Take it outdoors and add what you need to make it work. Add string lighting, lanterns or solar lights to brighten up your outdoor space. Or even better, outdoor fire pits and chat groups are the perfect way to add light and warmth to any space.